➤The Right Angle Clamp is a durable aluminum tool that is very effective for making cabinets or box-frames, and functions as a third hand for the every handyman. ➤ It's useful function of an assembly aid helps in the alignment and clamping of parts for nailing, welding, and screwing. ➤The clamp's ergonomic handles and quick-release mechanism allow for easy adjustments, while the 2-1/2-inch jaw capacity handles most clamping jobs. ➤ A 3-inch clamp face with V-groove design is also included to hold round materials. ➤Other features include a clamping device for 90-degree corner joints, and a saw guide for 45-degree mitre cuts and work bench vice. ➤You can use it as a clamping device for 90° corner joints, a saw guide for 45° miter cuts, and as a workbench vise. ➤A must-have for woodworkers, cabinet makers, handymen and DIY'ers alike. ➤ 90° Quick-Release Corner Clamp & Vise is great for simple tasks, like aligning and clamping parts for nailing, welding and screwing, and just as good for more complicated jobs, like making cabinets, box-frames and picture frames. ➤ Helpful 'Third Hand': 90° Quick-Jaw Corner Clamp & Vise. It's a great help for aligning and clamping parts for nailing, welding and screwing. ➤ Clamping for 90° Corner Joints: Set it and forget it! Finish your corner joint and quickly secure the workpiece in place using the quick-release buttons. Use the threaded handles for fine adjustments. ➤ Cabinets & Box-Frames:Cabinet and Box-Frame projects don't need to be intimidating. This helping hand will keep your parts securely in place, allowing you to fasten or move to another part of the workpiece. 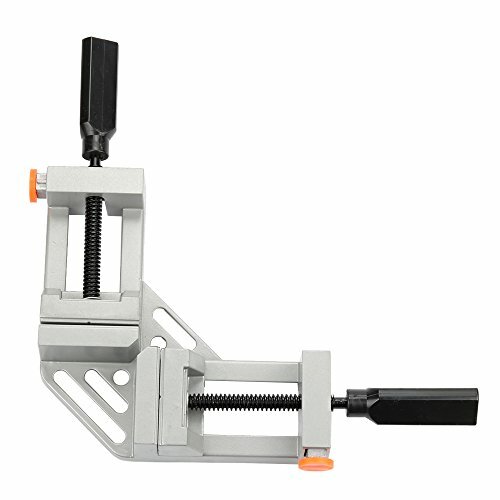 ➤ Great Help for Picture Frames: 3" clamping face can handle flat parts and round or irregular parts using the V-Groove channel. If you have any questions about this product by Highmoor, contact us by completing and submitting the form below. If you are looking for a specif part number, please include it with your message.